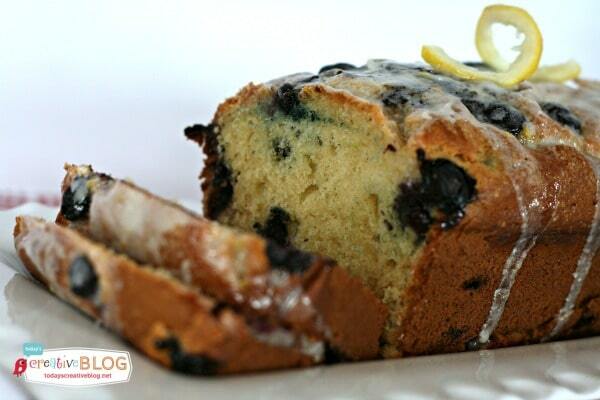 I am so thrilled to share this Blueberry Lemon Bread with Lemon Glaze with all of you! I’ve been making this recipe for years and it never fails me. Thanks to Stephanie for asking me to be a part of this fun series. I’m Kim from Today’s Creative Blog and InspirationDIY.com, where I share all things creative and inspiring. 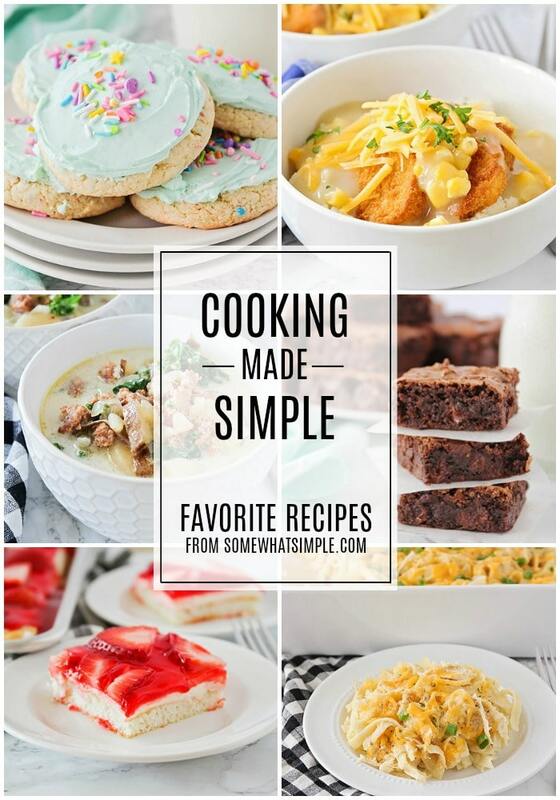 Recipes, Home Decor, Crafts, Printables…..you name it, I’m sure I have it. Being from the Pacific Northwest, we have an abundance of farm fresh produce. I’ve been picking and freezing peaches, strawberries, raspberries and a TON of blueberries! I’ll even make up tomato sauce to freeze for all the yummy soups I make, like my Crockpot Tomato Ravioli Soup! It’s my favorite! We are well stocked for the winter. I have a weakness for quick breads. If it’s bread and it’s sweet…..hand it to me. Add blueberries and lemon glaze and just leave me alone. This bread is delicious for a snack or grab a slice for breakfast, of course it’s perfect for a brunch. Eat it alone or smear on some butter…..any way you eat it, it’s going to be delicious! 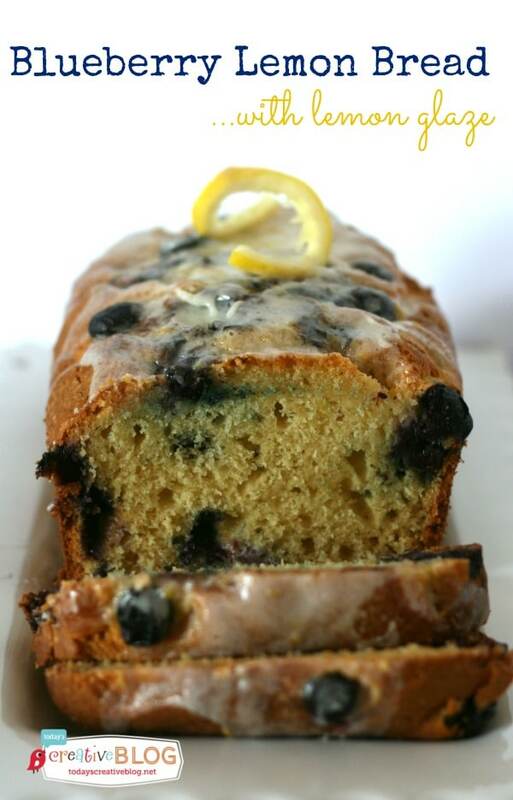 I love the slight tang of lemon in both the bread and the glaze. 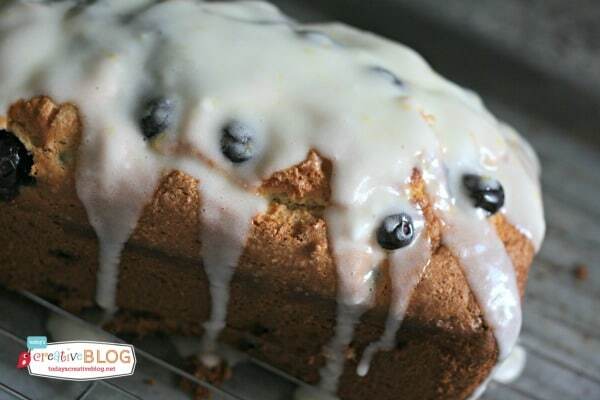 If you wanted to forget the glaze….it’s still good! While baking I placed a tin foil tent over the top about half way through to prevent over browning. Is your mouth watering yet? Making glaze is one of the easiest things ever! Cream, powdered sugar and lemon juice and zest. I probably should have added a teeny bit more cream to make it thinner, but it soaked in and upped the delicious factor. The sour cream in the recipe makes it “melt in your mouth” moist. You could also use yogurt if you didn’t have any sour cream. Heat oven to 350°F. 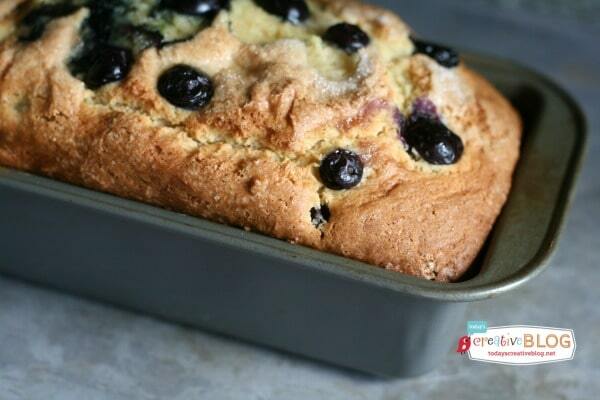 Grease your bread pan (9×5-inch) or muffin tins with cooking spray or shortening. I used my kitchen aid mixture. Place your soft butter and sugar and beat on medium until blended. Add and beat in eggs, lemon juice and peel, vanilla and sour cream. Stir in baking soda, baking powder, then slowly add flour. Mix until blended. 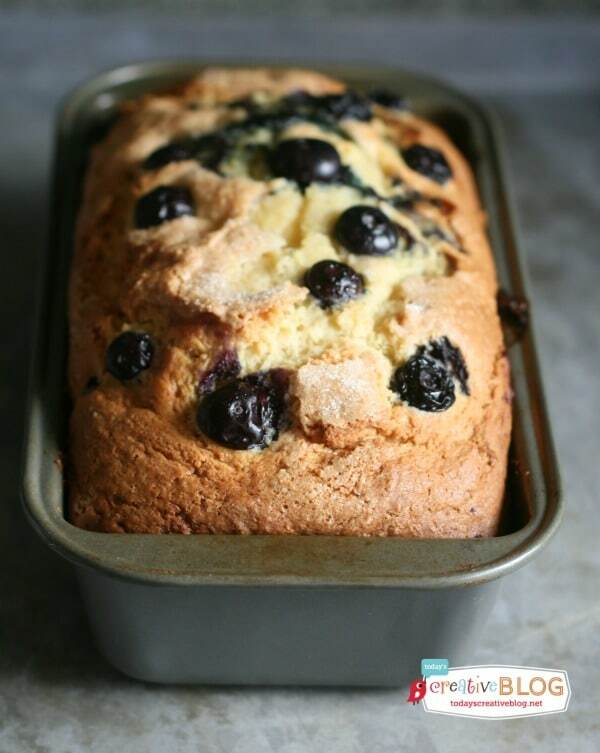 Gently fold in the blueberries, reserving a few to sprinkle on the top. Spoon batter into your loaf pan or muffin tin. Sprinkle a little sugar on the top if you’re not going to glaze it. Sprinkle on a few berries. Cool for about 15 minutes before removing from the pan onto a baking rack. While it’s cooling, mix up your glaze. Pour over the loaf and enjoy! Want more from me? 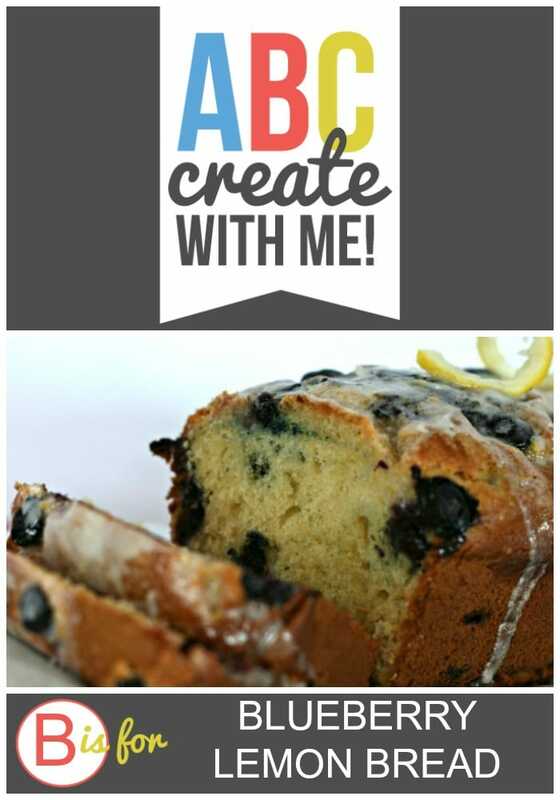 Head to Today’s Creative Blog or my Pinterest Boards!